We’d love your help. Let us know what’s wrong with this preview of Hope on the Inside by Marie Bostwick. "Whatever comes your way, find the happiness in it." Hope Carpenter received that advice from her mother decades ago. Now, with their four children grown, Hope and her husband, Rick, are suddenly facing an uncertain future, a In this compelling, heartwarming novel from New York Times bestselling author Marie Bostwick, one woman finds new purpose in a new phase of life . . .
"Whatever comes your way, find the happiness in it." Hope Carpenter received that advice from her mother decades ago. Now, with their four children grown, Hope and her husband, Rick, are suddenly facing an uncertain future, after a forced retirement strains both their savings and their marriage. Seeking inspiration and a financial boost, Hope gets a job teaching crafts to inmates at a local women's prison. Embarking on an ambitious quilting project, Hope and her students begin to bond. Together, piece by piece, they learn to defy expectations--their own and others'--and to see that it's never too late to stitch together a life that, even in its imperfections, is both surprising and beautiful. "Reading Marie Bostwick is like wrapping yourself up in a warm, hand-crafted quilt." task. . . . A great addition to any women's-fiction collection." "Beautiful, thought-provoking, tragic and redeeming, The Second Sister is a feel-good goldmine." To ask other readers questions about Hope on the Inside, please sign up. Hope and Rick Carpenter were comfortable with their life. Their four grown children are pursuing careers and Hope was enjoying her return to teaching. But life was soon to upended when both lost their jobs to budget cuts and new management. They decide to sell their home in Portland to move to Olympia to be near their recently married daughter, McKenzie. Both are struggling to adjust to their new situation, Rick becomes depressed and Hope, ever the optimist, takes a job teaching crafts to inmate Hope and Rick Carpenter were comfortable with their life. Their four grown children are pursuing careers and Hope was enjoying her return to teaching. But life was soon to upended when both lost their jobs to budget cuts and new management. They decide to sell their home in Portland to move to Olympia to be near their recently married daughter, McKenzie. Both are struggling to adjust to their new situation, Rick becomes depressed and Hope, ever the optimist, takes a job teaching crafts to inmates at the nearby women's prison. She quickly finds herself well over her head, but determinedly sticks to it, slowly bonding with the women. She implements a quilt project to teach the women valuable life lessons. Rick, though, is not so quick to get out of his funk, and McKenzie is experiencing trouble in her marriage. Can they find hope for a brighter future? Anna Felicia wrote: "Wonderful review, Anna 💖"
Thanks, Marie Bostwick is a favorite of mine. Overall the story was captivating, intricate writing, surprises and heartwarming (I found myself smiling as I was reading) characters are what make this so special. The author did a great job with the story-line. I fell in love with the characters, and could feel the love the family felt for each other. The author did a great job in telling the story in a subtle way. Although there is some religious aspects (a prison chaplain and Christmas services) to the book it was not at all preachy. You know Overall the story was captivating, intricate writing, surprises and heartwarming (I found myself smiling as I was reading) characters are what make this so special. The author did a great job with the story-line. I fell in love with the characters, and could feel the love the family felt for each other. The author did a great job in telling the story in a subtle way. Although there is some religious aspects (a prison chaplain and Christmas services) to the book it was not at all preachy. You know the feeling when you’re reading a book and are so in love with the characters you’re sad it’s ending? This was that book for me. I fell in love with Hope, Rick, Hazel and Mackenzie. I also loved the side characters, even some of the prisoners. The story was well written and the characters were well developed and believable; they were definitely the driving force of this story. Marie Bostwick has a different but realistic way of looking at life. The story is compassionate and sometimes heartbreaking and that brings each character to life and draws you in from the first page to the end. I couldn't stop reading, it pulled me in and made me feel as if I was experiencing what each character was feeling. It's a must read if you believe in community and family. An emotional story, an amazing book. Ms. Bostwick, you have a new fan. Thank you NetGalley, Kensington and Marie Bostwick for the opportunity to read this book in exchange for an impartial review; all opinions are my own. An intricate and heart wrming story. Hope Carpenter has been a stay at home mom raising her four children. She starts teaching Family And Consumer Science at a school after her children have grown up and started living on their own. However, just when she feels nothing could go wrong her husband, Rick is forced into early retirement from his engineering job forcing them to sell their home in Portland Oregon and move to Olympia, Washington. Rick's depression and upcoming financial changes have Ho An intricate and heart wrming story. Hope Carpenter has been a stay at home mom raising her four children. She starts teaching Family And Consumer Science at a school after her children have grown up and started living on their own. However, just when she feels nothing could go wrong her husband, Rick is forced into early retirement from his engineering job forcing them to sell their home in Portland Oregon and move to Olympia, Washington. Rick's depression and upcoming financial changes have Hope looking for any job she can find to make ends meet. She secures a job teaching crafts at the local women's prison. There are a lot of rules and policies at the prison to protect staff and inmates and Hope frequently clashes with the prison in charge, David Hernandez. Hope meets some interesting people like Nancy the chaplin, the guards and especially the inmates Mandy and DeeDee.She learns there is the women in prison have grown up in difficult circumstances, most of which aren't their fault or in their control. Through her classes, she is able to give these women a sense of purpose and a way of giving them hope for a better life. At the same time, Hope learns her own life lessons in dealing with Rick, her adult children, her sister, Hazel, and her boss David. This is one of those books which you love so much you want to read till the end but you also don't want to finish because it would mean letting such a great book go. Marie Bostwick, bestselling author of uplifting historical and contemporary fiction, with a Macomber-esque flavour to her writing, is a new-to-me author. Her heartwarming novel, Hope on the Inside (a play on words), left me all warm and fuzzy when I hit the final page. Sweet, sincere, redemptive, inspiring… I could go on-and-on, but this title hit all those boxes. This was not deep, thought-provoking fiction by any means. It was, however, charming and easy-to-read, dare I say, even inspiring desp Marie Bostwick, bestselling author of uplifting historical and contemporary fiction, with a Macomber-esque flavour to her writing, is a new-to-me author. Her heartwarming novel, Hope on the Inside (a play on words), left me all warm and fuzzy when I hit the final page. Sweet, sincere, redemptive, inspiring… I could go on-and-on, but this title hit all those boxes. This was not deep, thought-provoking fiction by any means. It was, however, charming and easy-to-read, dare I say, even inspiring despite its triteness. It’s a story that’s been told a million times before, but it had its own unique spin and was quite the enjoyable page-turner. Hope Carpenter has raised been a stay at home mom raising her four children and just when she's found her dream job teaching FACS, Family And Consumer Science, formerly known as Home Ec. her husband Rick is forced into early retirement from his engineering job. Eighteen months later they find themselves selling their home in Portland Oregon and moving into a condo apartment in Olympia, Washington near their only daughter McKenzie. Rick's depression and upcoming financial change Very moving story. Hope Carpenter has raised been a stay at home mom raising her four children and just when she's found her dream job teaching FACS, Family And Consumer Science, formerly known as Home Ec. her husband Rick is forced into early retirement from his engineering job. Eighteen months later they find themselves selling their home in Portland Oregon and moving into a condo apartment in Olympia, Washington near their only daughter McKenzie. Rick's depression and upcoming financial changes have Hope looking for any job she can find. To her surprise she is offered a job teaching crafts at the local women's prison! There are a lot of very detailed rules to follow to protect staff and inmates and Hope chafes at them with her boss David Hernandez's already gloomy predictions on the outcome of craft classes for inmates. I volunteered to read an ARC from Kensington through Net Galley. Hope meets some interesting people like Nancy the chaplin, as well as the guards and especially inmates Mandy and DeeDee. Hope sees first hand that life on the inside is not what she expected, if she even though about it. She learns there is another world that the women in prison have grown up in and their circumstances that led them here aren't always their fault. Meanwhile Hope learns her own life lessons in dealing with Rick, her adult children and her sister, Hazel, her boss David. There are many moments when your heart strings are being pulled in sympathy, anger, frustration and joy. A wide range of emotions in one novel. Rick and Hope have had a long successful love-filled marriage with give and take and honesty between them while raising four children to adulthood. Neither expected that they would be scrambling for jobs and living in a new place before they turned 60 and so close to the easy retirement they must have envisioned. Rick was definitely more troubled by the situation than Hope who immediately went out to find employment. Rick did try but was overqualified for anything he applied for. Hope does get a job working in a women’s prison teaching crafts and that gives her purpose as Rick tries to find himself and who he will be after his work as an engineer ends. The book includes the children and a bit about their lives and a big focus on one of the women in prison in Hope’s class. There are side stories aplenty. All in all a pleasant read but one that seemed rather predictable and perhaps not my favorite written by this author. Thank you to NetGalley and Kensington Books for the ARC – This is my honest review. Your name alone has to mean something. In the ancient world, names usually carried a meaning. They were more than something to scribble on a paper cup so somebody knows which latte belongs to you. Names denoted character, sometimes destiny. Perhaps Hope will be the one to bring hope to the inside. Hope and Rick Carpenter have it all. A lovely home in Seattle area, Rick a great job working at a engineering firm, Hope as a teacher, and their daughter and 3 sons, living life to the fullest. A famil Your name alone has to mean something. In the ancient world, names usually carried a meaning. They were more than something to scribble on a paper cup so somebody knows which latte belongs to you. Names denoted character, sometimes destiny. Perhaps Hope will be the one to bring hope to the inside. Hope and Rick Carpenter have it all. A lovely home in Seattle area, Rick a great job working at a engineering firm, Hope as a teacher, and their daughter and 3 sons, living life to the fullest. A family that has had ups and downs but when their lives are tested with a terrible loss, they lose sight of what they had only to gain it back stronger. With the loss of Rick's job, they now must downsize and move to a cheaper area in Washington State. If anyone has struggled with a job loss, you will connect immediately to Rick's pain and how he copes. We all cope in different ways but his was cooking and unfortunately, loosing connection to his wife Hope. Hope having to start over in a new city, gets a job as a arts and crafts teacher in a women's prison. Hope is a firm believer of our need to create and to have purpose. She connects with well with others and is truly the hero of this prose. A prose that is relational driven which is the best kind for me. How circumstances that seem hopeless change when we want the best for others. How when others take notice of our pain and see past them, bring hope to who we are. How our identity is tied in the things that don't matter only to learn fighting for others to find theirs teaches us that we all are human. Hope Carpenter's four children are grown and her husband recently accepted an early retirement package, Hope struggles to find meaning in her life. She recalls her mother telling her "Make up your mind to be happy, Hope. Whatever comes your way, find the happiness in it. That's the real trick of life." When downsized from her job as a Family and Consumer Science teacher and faced with dwindling resources, Hope and Rick decide to sell their house and move from Portland to Olympia to be closer to Hope Carpenter's four children are grown and her husband recently accepted an early retirement package, Hope struggles to find meaning in her life. She recalls her mother telling her "Make up your mind to be happy, Hope. Whatever comes your way, find the happiness in it. That's the real trick of life." When downsized from her job as a Family and Consumer Science teacher and faced with dwindling resources, Hope and Rick decide to sell their house and move from Portland to Olympia to be closer to their daughter, McKenzie. When they buy a condo, life seems even more restrictive, due to the lack of outdoor activities and the loss of friends. When Hope accepts a job as a craft teacher at the local prison, Hope has to deal with the prison rules and Rick with the idea of his wife earning the money to support them. The idea of teaching women to quilt and to help the women develop a skill draws Hope closer to them. It's a win-win situation until one of the inmates is cut with what looks like a rotary cutter blade from the sewing room and Hope violates the prison rules. 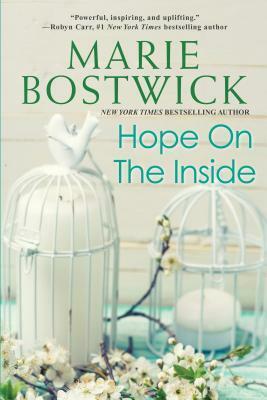 Hope on the Inside by Marie Bostwick is a captivating novel of family, friendship and new beginnings. Hope Carpenter's life changes drastically following her husband Rick's unexpected forced retirement. They manage to keep their heads above water but when cuts in school funding eliminate her teaching position, their financial situation is becoming increasingly precarious. Despite a few misgivings, Rick and Hope sell their home in Portland and move to Olympia to be closer to their daught 4.5 stars. Hope Carpenter's life changes drastically following her husband Rick's unexpected forced retirement. They manage to keep their heads above water but when cuts in school funding eliminate her teaching position, their financial situation is becoming increasingly precarious. Despite a few misgivings, Rick and Hope sell their home in Portland and move to Olympia to be closer to their daughter, McKenzie. After settling into their new life, Hope is hired by the local women's prison as an arts and crafts instructor. Despite her trepidation and rather bumpy first month on the job, she is pleasantly surprised by how much her students and her new career mean to her. On the home front, she and Rick are experiencing an unsettled period in their marriage as he struggles to find a job. Will Hope and Rick regain their once close relationship? Hope is an incredibly upbeat woman who faces the upheaval in her life with a positive attitude. She does not allow her disappointment over the move or lack of support from Rick stop her from accepting the job at the prison. Instead, she throws herself wholeheartedly into her new career. Hope does have to work hard to overcome the prison superintendent's stringent rules to achieve her goal of helping the women learn valuable life lessons through quilting. As she settles into her new career, Hope cannot help but become invested in one of the inmates as she prepares for life after her release from prison. Once a valuable and sought after employee, Rick is taken aback by how deeply affected he is by the loss of his job. He is also dealing with a heartbreaking loss in addition to losing his career and their relocation. Disheartened by his dismal job search, Rick eases his frustration by immersing himself in baking and watching cooking shows. He does finally begin to find his way out of his depression, but is it too late for Rick to get his marriage back on track? Hope Carpenter and her husband, Rick, are at a crossroads. Hope has raised their four children and is going back to teaching. They are where they want to be. In the blink of an eye they are suddenly out of jobs and the financial and emotional stress is affecting them both. Selling their home and moving closer to their only daughter along with Rick's severance package have given them a bit of financial security but they both are feeling unsteady and afraid, which leads to quite a bit of tension. Hope is determined to find a job and contribute financially and feel useful. She didn't think that job would be teaching female inmates in prison. After some initial trepidation, she finds herself loving the job and the young women. Hope finds that teaching these young women to quilt will have a dramatic effect. They are learning to be normal. To think, plan, pour their hearts into something they can feel ownership over and pride in themselves. This one has all of the feels in it. I laughed, I cried, I was indignant! Bostwick always gives us such beautiful stories. I always learn something I needed to learn. Okay, now onto the book review. I’ve been a fan of Ms. Bostwick’s for years and I really enjoyed her newest book. Even thought I can’t sew a lick, I always enjoy the quilting segments Marie inserts into her books. The same way I don’t like wine, but love books based at wineries. I really enjoyed the changing dynamics between Hope and Rick throughout the book—it was nice to see a long-married couple struggle through life’s changes but never give up on themselves or each other. I also like Hope’s struggles of being a mother and fulfilling her own well of passion. I think it’s a common occurrence to those entering the second (or third?) phase of our lives. Hope may have been the main character, but hope was the main theme—finding hope when all seems hopeless and offering hope to those who feel as if they have none. I’m a big believer of hope in all forms and this book was a testament to a lot of them. When you finish this book, it will leave you feeling uplifted. Hope is a wonderful teacher who loves her job, family, students and her life. Her children have all grown up to be wonderful adults and have left the nest. She is older now and since her husband lost his job, she needs to find a place that provides some benefits for her and Rick. When she applies for employment in a prison to teach, she isn't thinking how this will change her life. She is wondering how she will surv I loved this story! She is wondering how she will survive each day with a tough group of inmates who cannot trust anyone. Marie Bostwick writes from the heart and her stories reflect a love and caring that in these times, we all desperately need. "Trust me. You won't be in this alone." This is the best book I have read in a VERY long time. I was captivated from the very first page. I crawled inside the book and hated to leave its pages and the people within its pages. The characters are flawed, hurting and extremely relatable women. Hope On The Inside is a fiction book that shows the true life consequences of believing in people who do not believe in themselves. This is just an incredible story that is extremely well-written. I so very highly recommend it. I had not previously read a book by Marie Bostwick but I will be rectifying that immediately! I was worried for a little bit - where are the quilts? Its not a Marie Bostwick book without quilting! I was not disappointed - either in the story or in the appearance of the quilts. Marie Bostwick took a difficult topic of incarcerated women and gave it such a beautiful spin on the inmates - too often we only see when for what they have done and not for who they are as people. I can easily gloss over the too good to be true characters (Rick seemed to be trapped in the '50s and McKenzie has ser I was worried for a little bit - where are the quilts? Its not a Marie Bostwick book without quilting! I was not disappointed - either in the story or in the appearance of the quilts. Marie Bostwick took a difficult topic of incarcerated women and gave it such a beautiful spin on the inmates - too often we only see when for what they have done and not for who they are as people. I can easily gloss over the too good to be true characters (Rick seemed to be trapped in the '50s and McKenzie has serious Daddy issues and could be a book of her own) because this was just an overall feel good story. Hope finds herself in need of a job at a time when she least expected to-and her husband Rick is none too pleased about it or the job she's taken. She's working in a women's prison, teaching crafts. As Hope teaches the inmates how to make a quilt, their stories come out. This is light reading (there are no horror stories here and you're only getting one side) but it's also encouraging. Thanks to NEtgalley for the ARC. It's all about redemption and finding yourself where you least expect to. I always think I’m going to read Marie’s books slowly and really savor them. But I just can’t do it! I always have to read just one more chapter and before I know it the story is over. This time we get to learn a little bit about Olympia, WA all while following Hope’s journey to help women who are incarcerated. There’s a good dose of quilting, too. And of course Marie always gives us a thought provoking story with a happy ending. I just love Marie Bostwick. Her books always celebrate friendship, family, growth and QUILTING. Her stories are approachable, but rich with all the best happy things anyone would want in life. I loved her Cobbled Court series - that's where I started. I bought the book for the cover and was hooked. For me this story started to fall apart about 3/4 of the way through. I don’t want to give away and spoilers so I’m just going to keep it brief. The characters were developing so nicely along with the plot and then bam bam bam!! All this over the top stuff started happening and it just didn’t flow with the story or characters. Especially Hope. Overall I was left disappointed. I loved this story of Hope and Rick's family and her work at the prison teaching women prisoner's crafting and quilting. This is one of the BEST books I have read by Marie Bostwick and this is saying something since all of her stories are deeply moving and full of good people. I started this and read it in a 24 hour period because the story is so compelling. Marie Bostwick is my favorite author. That being said, I thought this one rambled from one situation to another without really joining together. But I suppose that's what Hope and her family life were like.... sort of having separate lives without really coming together, until they had worked through things. A good read overall. Marie Bostwick is the real deal. Her stories are like being in the hands of a classic American chef who can cook all the basics better than anyone but still has an innovative eye for the current heartbreaks in our world; the criminal justice system, empty nesters, marriages beyond children and jobs, etc. This is the first book I’ve read by Marie Bostwick. Her story is reality fiction steeped in hope. Family issues, depression, PTSD, women and friendship and victory over struggles. I am hoping this book is a series and I’ll get to keep in touch with her characters. Grab a cup of coffee and curl up with this book on a rainy day. You’ll be glad you did. Marie Bostwick is a New York Times and USA Today bestselling author of uplifting historical and contemporary fiction. She lives in the state of Oregon and travels frequently to sign books, speak to reading groups, and meet her readers. Keep up with Marie and her lifestyle blog at @fiercebeyond50.